If You’re Really Brave, Adopt a Kitten! It’s spring again—green grass, flowers and lots of kittens! In spite of our valiant efforts to control the cat population with spay/neuter programs we always seem to have a bounty of fluffy babies in the spring. Maybe this is our reward for enduring a long, boring winter. Kittens are never dull or boring. They are enthusiastic and energetic—the embodiment of spring. Now if you are in the market for a new feline companion, we have some guidelines that can make this experience unique and wonderful. It will take a little work at first, but the reward for your efforts will be a benefit to you and your cats for many years. Your first important decision is to determine the proper time to adopt the pet. If the kitten is under 8 weeks of age, it should stay with its mother and litter mates until they are at least 10 weeks old. Kittens learn valuable social skills from the mother cat and the siblings at this time, such as how to inhibit biting, proper play and the all important litter box habits. Kittens love to play and hunting is their game. If you don’t want to be the prey, then take out your fishing pole toy or laser light and let the games begin. If it moves, kitty will chase it. Another popular kitten sport is climbing Mount Everest aka your drapes or anything they can obtain height from. This muscle-building activity drops off when kitty learns to high jump. Be sure to get a good scratching post for kitty to climb. The Ultimate Scratching Post™ is highly recommended or make your own, see our article on “How to Build A Scratching Post“. Now if getting a bundle of energy doesn’t sound like fun to you, then go down to your nearest animal shelter and select a sweet older cat that will be thrilled to sit in your lap and purr your troubles away. Don’t get a kitten. 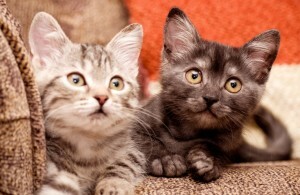 If you are still insistent on getting a kitten, here are a few more tips that will keep your kittens safe and healthy. Like small children, kittens need to be protected from injury. Kittens love to explore and can get into dangerous places. Kitten proof your house from any dangers they might find to play with and explore. Know where your kitten is before you start any appliances or even sit down on the couch. Kittens can get wrapped up in cords and choke on small items in the house. When you are not able to watch them, put them in a kitten-proof room or a large kennel with things they will need. Food, water, litter box and safe toys. Something to scratch on and climb. Plan to have your kitten spay or neutered before 7 months of age or it is possible you will have urine marking problems. This surgery is healthy and necessary. Talk to your vet, sometimes they can be altered at even an earlier age, the sooner the better. Everyone wants a cat that is friendly and sociable. This may be the most crucial lesson of all, it involves confidence-building and trust. Ideally the kittens will have experienced gentle handling from birth. 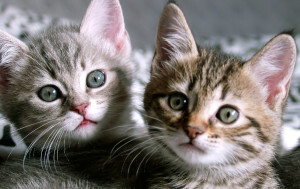 It is your job to introduce your kittens to a variety of experiences and people and other friendly animals. You are there to protect the kittens and make sure the experience is a safe and positive one. They will put their trust in you not to let anything hurt or frighten them. It is also important to introduce you kittens to a variety of foods including dry and canned foods. Cats that are brought up only one type of food may later refuse to eat anything else, rejecting more nutritious foods. Most of all, your kittens need your attention. You are their security, you have become there mom. Pet them and play with them and Love them. Never let anyone play with the kittens with their hands and feet. That type of play encourages biting and it can be painful and dangerous especially when they are older. Cats have a need to hunt and play so it is important to select safe toys that can amuse your cat while you are gone. Pioneer Pet® has several toys for this purpose. With the proper up-bringing you will enjoy your cats for many love-filled years. All of your hard work will be rewarded in the end. Love your baby!